In recent years the gambling landscape in Britain has changed significantly. The introduction of the Gambling Act 2005, which came into effect in 2007, has allowed the responsible advertising of gambling and the addition of licensed online gambling, making it possible for problem gamblers to access gaming facilities 24 h a day. While gambling has traditionally been perceived as a male recreational activity (Potenza et al. 2001) and a male addiction, recent gambling prevalence studies indicate the gap is narrowing as a greater number of women are now gambling (Wardle and Seabury 2013; Wardle et al. 2011). Yet little research has focused on female problem gamblers and, in particular, aspects of the treatment-seeking experience for women has been neglected. According to the latest British Gambling Prevalence Survey, commissioned by the Gambling Commission, which regulates gambling activities in the UK, there are between 360,000 and 450,000 adult problem gamblers in Great Britain. The prevalence of male problem gambling increased from 1% in 2007 to 1.5% in 2010, while female problem gambling increased from 0.2% in 2007 to 0.3% in 2010, which translates to 75,000 women in Great Britain (Wardle et al. 2011). Interestingly, the increase in overall prevalence for women was driven by younger females. The survey also found that there has been a general increase in participation in gambling since the 2007 survey from 68 to 73%, and this increase was greater among women than men (65% in 2007 and 71% in 2010, respectively). Since gambling participation seems to be increasing faster among females than males, there may be differences in reasons for gambling requiring different treatment needs which need further examination. Furthermore services and professionals need to be prepared to treat an anticipated increase of gambling related problems in the UK. In 2007 the British Medical Association (BMA) proposed that the NHS should provide sufficient support for gambling disorders, alongside the services it provides for drug and alcohol problems (Griffiths 2007). The theoretical review of evidence indicates that therapeutic interventions can be helpful in reducing the severity of gambling problems and improving psychological well-being in individuals with gambling related problems (Lopez Viets and Miller 1997 cited in Dowling and Cosic 2011). Current intervention options for the treatment of problem gambling in the UK include counselling, psychotherapy, cognitive-behavioural therapy (CBT), advisory services, residential care, pharmacotherapy, and combinations of these (Griffiths 1996; Griffiths and MacDonald 1999). Yet relatively few people with gambling difficulties seek treatment (Cunningham 2005); those who develop problems in the area appear unwilling to admit these difficulties and tend to present for treatment when the severity of their difficulty drives them to treatment as a last resort (Suurvali et al. 2009), or until they have reached a crisis point (Bellringer et al. 2008). Studies from the US, Canada, Australia and New Zealand have found that between 7.1 and 29% of problem gamblers with varying degrees of difficulties seek formal help or access treatment for their problems (Cunningham 2005; Slutske 2006; Volberg et al. 2006; The Productivity Commission 2010; Ministry of Health 2007; Suurvali et al. 2008 cited in Suurvali et al. 2009). This can result in serious negative consequences for the gambler or their family, including suicidal thoughts or relationship breakdown (Carroll et al. 2011). In addition to low numbers of individuals seeking help for gambling related problems, there are some indications that female problem gamblers are underrepresented (compared to males) in UK services. The National Problem Gambling Clinic (NPGC), which opened in 2008 and is funded partly by the Responsible Gambling Trust, is currently the only NHS multidisciplinary treatment centre for the treatment of problem gamblers with only one branch located in London. The NPGC offers a programme of individual or group cognitive-behavioural therapy (CBT). All treatment is facilitated by psychiatrists, psychologists and trainee psychologists. The programme supports the role that conditioning principles play in the maintenance of problem gambling and emphasises the way that individuals’ thinking affects their behaviour. Throughout the course of the eight sessions, individuals are given strategies to stabilise excessive gambling and once gambling is reduced, they are offered tools and techniques to help cope with urges to gamble and to minimise harm in the event of a lapse. The programme aims to teach life skills, such as mindfulness, and encourages alternative healthy activities and hobbies. Remote CBT, which is a condensed version of the treatment administered by a therapist via the telephone, is offered to individuals unable to attend treatment in person. Between 2012 and 2013, the NPGC, received 635 referrals for treatment, with 7% of these referrals (N = 47) being from female problem gamblers (NPGC 2013). Despite the rise in numbers of female problem gamblers in the general population, the figure for female referrals has remained static since the clinic opened in 2007, prompting further investigation. Figures reveal that between March 2012 and April 2013 females were less likely to attend an offered assessment at the NPGC than men (70% compared with 81%) and more likely to miss an assessment (13% compared to 7%). Those females who attended the assessment and were then referred for treatment were much less likely to have a ‘planned’ discharge than men (27% compared to 50%) and more likely to drop out of treatment early (25% compared to 12%) (NPGC 2013). These numbers support other findings of a ‘relative absence’ of females in treatment settings where research samples of problem gamblers have previously been recruited. (Crisp et al. 2000). This is in contrast to the trend seen elsewhere in mental health where the prevalence of mild to moderate mental health conditions (mainly anxiety and depression) is thought to be similar between men and women, but women are more likely to seek help than men. In 2007 the NHS published statistics reporting that 29% of adult females were being treated for mental health disorders compared to 17% of men seeking treatment, despite similar levels (Halliwell et al. 2007). Research has identified barriers to seeking treatment for problem gamblers, although this is not UK based and therefore should not be assumed generalisable to the UK population of problem gamblers, where presentations may be different. Furthermore, it is not gender specific, and therefore does not provide insights into barriers for female problem gamblers specifically. A literature review reporting on findings of 19 studies in five countries (Canada, Australia, New Zealand, US and Brazil) found the most commonly reported barriers were: a wish to handle the problem by oneself; shame/embarrassment/stigma; unwillingness to admit the problem; and issues with treatment itself (Suurvali et al. 2009). Other frequently reported barriers include lack of knowledge about treatment options and practical issues around attending treatment. In their quantitative study which looked at a sample of 1259 indigenous Australian adults, McMillen et al. (2004) proposed that gambling help-seeking may be reduced due to lack of awareness of gambling harms or poor access to information and gambling services. Gainsbury et al. (2014) argue that public education should aim to de-mystify the treatment process and educate gamblers about symptoms of problem gambling to reduce shame, stigma and denial and encourage help-seeking. While there is limited research which identifies barriers for women specifically, Karter (2013) argues that women coming forward to ask for help have twice the amount of difficulties in terms of emotional, psychological and social blocks in doing so. Grant and Kim (2002) stress the importance of more aggressive and early interventions for female problem gamblers based on the ‘telescoping effect’, with quick progression of gambling problems for women. Meanwhile Wenzel and Dahl (2009) propose that treatment for female problem gamblers should focus on emotional needs, disputing the evidence base for the benefit of brief interventions. Dowling et al. (2006) proposed that CBT is an effective treatment model for female problem gamblers, based on their Australian-based, quantitative study with 19 women with Electronic Gaming Machine (EGM) problems. Yet at present the National Institute for Clinical Health and Excellence (NICE) does not offer any guidelines for the treatment of individuals with a gambling disorder. In addition to this lack of ‘best practice guidelines’, there are varying approaches for treatment for women specifically. This murky path for treatment is arguably further fueled by existing disagreements about what counts as a gambling ‘problem’ (Blaszczynski and Nower 2002). To our knowledge there has been no published research that has phenomenologically explored the experience of treatment, or barriers to treatment for female problem gamblers in the UK. Thus, the current study, obtained via interviews, aimed to explore the lived experience of female problem gamblers who have received treatment for a gambling problem. Additionally, it was aimed at gaining access to the meanings participants attributed to the barriers of seeking and receiving treatment. Participants selected fulfilled criteria for being female, speaking fluent English, being over 18 years of age and having received treatment at the National Problem Gambling Clinic (NPGC). The clinic was deemed an ideal base to conduct this study providing access to a hard-to-reach population. Recruitment of participants involved a standardised flyer given to patients at the time of their assessment. Nine female subjects who had either completed treatment or were nearing completion of treatment were invited to participate in the study. Following screening calls, eight of the nine female volunteers agreed and were accepted as participants and completed interviews. Seven of them had received individual face-to-face CBT and one had received remote CBT. The number of sessions depended on individual circumstances. Table 1 lists the demographics of the participants recruited for the purposes of the study. Pseudonyms have replaced real names to ensure anonymity. Interpretative Phenomenological Analysis (IPA) is a descriptive and interpretative qualitative research method (Smith 1996, 2004). IPA was selected due to its potential to provide an ‘insider’s perspective’ through exploration, understanding and communication of the experiences and viewpoints offered by participants (Larkin et al. 2006). This correlates with the study’s aim to understand the particular phenomenon being investigated by eliciting the experiences of the ‘experts’ (Reid et al. 2005). Crucially, IPA recognises the role of the researcher in making sense of the experience of the researched (Osborn and Smith 1998; Smith 2004) acknowledging that the production of an interpretative account of a participant’s experience is co-constructed between researcher and participant (Larkin et al. 2006). The practice of reflexivity was therefore carried out throughout the research process in order to enhance awareness of the researcher’s contribution to the development of meaning-making (Nightingale and Cromby 1999). As IPA uses small sample sizes and views findings as context-dependent, statistical generalisability is not intended. However, findings can be combined with existing literature to inform practice. To ensure validity and reliability, Yardley’s (2000) four principles were consulted and applied throughout the research process. These include: sensitivity to context; commitment and rigour; transparency and coherence; impact and importance, all of which are proposed as a guideline in conducting high quality IPA. Smith and Osborn’s guidelines for conducting semi-structured interviews for IPA were consulted prior to constructing the interview schedule. Designed to be collaborative in nature, emphasising the participants as primary experts and aiming to make them feel as comfortable as possible, the interview schedule started with a question that encouraged participants to recount a descriptive experience. The questions were open-ended and served as a guide for possible areas to cover, rather than leading participants towards certain responses or imposing any views on them. This style of questioning should allow truth value to emerge—which is subject orientated, not defined a priori by the researcher (Lincoln and Guba 1985). Space was left for participants to express their feelings openly and in detail. Questions were asked about participants’ experiences of treatment, barriers to treatment, positive and negative aspects of treatment, meanings they attributed to being in treatment as well as their perceptions of themselves and their gambling behaviour after treatment. Analysis is an iterative and inductive cycle (Smith 2007) which involves flexibility and is expanded up until the stage of writing up; themes are constantly reworked and reorganised throughout this process. Constructing themes involved several stages. Interview transcripts were analysed using guidance on carrying out IPA (Willig and Stainton-Rogers 2008). On a case-by-case basis, each transcript was read several times. Summaries and descriptive labels were made along the margin using the participants’ words, before themes were assigned. Relationships between themes were analysed and clusters of themes formed. A cyclical activity of checking back took place to ensure that each theme was grounded in the original data. A summary table of themes, including cluster labels and illustrative quotes, was used to give structure to the data. Once relationships between themes had been established and collapsed into clusters, summary tables were created for each participant. A narrative summary based on overarching themes helped to sift out the most salient findings from the research. From here, illustrative examples of shared experiences were identified from the participants’ quotes along with those that were distinctive or contradictory. Importantly, the entire process is supported by a full ‘paper trail’, so that each step of the analytic process may be traced in detail (Yardley 2000). The analysis of the interview transcripts generated data providing a rich and insightful portrayal of the experience of treatment for female problem gamblers. 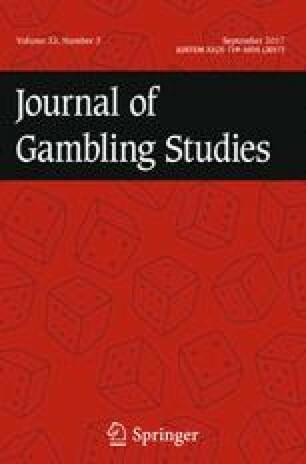 The subtheme ‘Barriers to Treatment’ is examined and expanded upon here since it was considered to warrant closer attention; perceived barriers to seeking treatment for female problem gamblers have not been explored in the UK literature and may help explain difficulties in reaching and engaging women. The findings are supported by participant quotations taken directly from the transcripts. To ensure anonymity and confidentiality, participants have been given pseudonyms and all identifying information has been either removed or altered. Many participants referred to aspects of treatment as being ‘inaccessible’ as they described their experiences of ‘waiting’, the geographical ‘distance’, cost of travel and the sense of searching for information or help. This sense of distance, whether in space or time, seemed to encompass not only physical proximity but also an emotional distance, as all participants communicated a desire for more flexibility, convenience, and control over their treatment options. For some, the experience of waiting seemed anxiety provoking, conjuring up feelings of uncertainty and even helplessness. For others, the investment of time necessary for treatment seemed problematic, imposing and constraining. Many participants described their search for information which was not always readily available, and the disappointment that ensued. Participants appear to feel disempowered by inaccessibility issues. Internal barriers were also identified. For many participants, denial and fear appeared to have delayed their decision to seek help. For three participants, being a woman was in itself a barrier to treatment. For others, the stigma associated with gambling as an ‘addiction’ was distressing, while for others this biological perspective provided comfort. All eight participants identified with a sense of feeling like an outsider, or as being abnormal in some way as though their gambling problems could not be understood by friends, family or treatment providers and professionals, which increased anxiety around help seeking. All participants also communicated varying degrees of ambivalence about giving up gambling, presenting some interesting challenges for treatment. It’s going to take your time and so on…like I’m going to have to….I know it sounds silly but I’m going to have to fill out some forms and then make my way to X or give X hours a week. Both Emma and Diana articulated their understanding about practicalities within the service with regard to the waiting list, yet their disappointment is clear, as Emma acknowledges ‘unfortunately three months on the trot I lost everything’. Catherine views herself as being unsupported as a ‘single female’, highlighting a sense of unavailability of help, yet in the same sentence she acknowledges her ‘separation anxiety’, which in itself acts as a barrier as Catherine becomes torn between getting help for herself and the anxiety she feels around leaving her children with others. An interesting juxtaposition emerges since her children have been both a motivating factor and an obstacle for Catherine to receive help, while she is unable to tolerate the isolation and overwhelming loneliness of her inner world. These narratives highlight several accessibility issues in treatment, highlighting the significance of time, waiting, distance, childcare and available information and support. Natalie articulates the uncertainty, doubt, mistrust, scepticism and fear she felt about therapy prior to attending, as she describes her concerns that ‘it wouldn’t work’, ‘how can it work?’ accompanied by her fear of losing control at the prospect of placing her inner world in the hands of a stranger and relinquishing some control, in case this might ‘change her opinions’, ‘brain’ or even ‘personality’. For Natalie, who admits she does not like feeling out of control, it was a big step to put her faith in professionals. As she disclosed her concerns, she appeared embarrassed, frequently laughing, letting me know ‘it sounds stupid’ as she fiddled with her hair and averted her eyes. It seemed difficult for her to communicate her fear, yet she was able to work through this and her relief was evident. Throughout Beth’s narrative she portrays her long, uphill search to find help. She experiences being cast aside and dismissed at GA, and it seems that this rejection feels familiar for her as she protests that she wants to stay in the room and describes the way ‘you get rejected a lot’, distancing herself from the painful experience by narrating in the second person. Not only does she experience rejection from society but also from treatment groups where she is turned away. Like Beth, Catherine feels she had some difficulty accessing treatment due to her gender, but for her it was the childcare access that proved to be the main barrier to treatment as previously discussed. However she also makes a more general observation about treatment availability for gambling, comparing it to drug and alcohol addictions. Emma’s sense of not feeling understood is echoed and repeated by all the participants in this study and dominated as a theme. Participants described feeling as though they were unique, different, special or abnormal in some way, viewing themselves as an outsider in a range of contexts. These descriptions communicated an expectation that participants would fail to be understood, seen or heard by others, portraying an isolated existence in which they are rejected, left to cope alone, without validation. They appear to feel alone with an uncommon problem, which for some acts as an obstacle to accessing help. Jacqui seems frustrated that her therapist did not have experience of gambling, as she poses the question ‘why should you be a gambling counsellor and not have experience?’, articulating that her therapist was not able to make a real connection with her since it felt as if she were being spoken to from a ‘text book’, as though her therapist were intent on box ticking rather than getting to know Jacqui. She articulates her sense of not being understood. For Jacqui, letting go of gambling also signifies a loss of ‘confidence’. She felt accepted as a gambler; protected and validated. It is as though the casino provided a temporary respite with a new sense of ‘confidence’. The narratives in this section demonstrate internal and external barriers to treatment, highlighting the complexity of female problem gamblers’ journey to treatment which appears to be fraught with practical accessibility issues and inner conflict. The present research provides novel insights from treatment-seeking female problem gamblers in the UK, highlighting some of the specific difficulties they experience throughout their treatment journey. Results suggest that women experience time, waiting, distance, cost and lack of information as practical barriers to treatment. Health care professionals may also be a barrier to treatment, preventing women from accessing services. The authors argue that unless professionals such as general practitioners are educated around the signs of problematic gambling, what to look out for and where to signpost, women may be unaware of having a gambling problem and may be failed in this way. Internal barriers which were prevalent and meaningful in the women’s narratives included denial of the problem, fear, ambivalence, stigma, shame, and feeling misunderstood. This supports findings from previous, non-gender specific studies from the US and Australia (Suurvali et al. 2009; Gainsbury et al. 2014), suggesting these barriers may be exist for both men and women. However, more specific information is not available to clarify which barriers were more specific to the men or women who participated in these studies; therefore it is difficult to make any links. Overall findings from this study suggest that service providers should consider alternative means of engaging female problem gamblers in treatment, which take into account clients’ resources, including their psychological mindedness, readiness to engage and openness to trying new things. Limitations associated with the NHS must be also taken into consideration. For example, waiting lists cannot easily be reduced when there is an increasing demand for services and lack of funding. However, this raises the question of whether more services are required to better meet the needs of problem gamblers. Further light can be shed on this by Rigbye and Griffiths (2011), who found that 97% of the NHS Trusts did not provide any service to treat people with gambling problems, arguing that treatment centres are not geographically accessible, and in this way the treatment needs of problem gamblers are not being met. This highlights the need for more research in this area and more collaboration between professionals working with problem gamblers in order to gain a better understanding of current difficulties. Results indicate that online therapy, helplines and forums may be beneficial for women to overcome some of the practical accessibility issues, such as time, distance, cost and childcare issues, supporting findings from recent studies that online support services appeared to be more favoured by women than any other service (Wood and Griffiths 2007; Rodda and Lubman 2013). These types of services aim to address barriers to treatment such as shame and stigma, geographic isolation and hours of operation (Rodda and Lubman 2013), and may therefore provide alternative means of engaging hidden populations who need help. A further recommendation based on these findings is that treatment providers should be mindful of the enormous challenges women have faced and overcome. These include stigma, fear, rejection and their sense of feeling misunderstood, or abnormal. In order to address this we propose providing a restorative relational experience in the therapeutic encounter, remaining person-centred rather than disorder-centred and providing a bespoke, individualised treatment experience that takes context into account. It also seems important to establish what conditions need to be present for an effective intervention, and how to help women overcome internal struggles to enable them to access and utilise available treatment. Motivational interviewing (MI) (Miller and Rollnick 2002) is a ‘person centred’ way of addressing ambivalence about change, in which the therapist may facilitate the client’s expression of both sides of their ambivalence and guide them towards a more acceptable resolution which may assist them in triggering change; in this way it is a collaborative approach to help strengthen a person’s own motivation and commitment to change. Hodgins et al. (2001) showed participants who received a motivational telephone intervention plus a self-help workbook were more likely to be classified as improved for gambling problems than those who received only the workbook with no intervention. This supports the idea of a motivational intervention, yet treatments for gambling problems are not well established and there is limited research that demonstrates which types of treatments are effective. More guidelines and research on treatments may serve to decrease uncertainty among practitioners or gamblers themselves as to treatment outcomes. This may involve consultation with NICE in order to establish more universal guidelines for treatment. Results suggest that more efforts are needed to further raise awareness of problem gambling and options for treatment of problem gambling, such as media-based campaigns and collaboration and discussions with GPs, social services and other professionals who are likely to come into contact with problem gamblers. This is so as to increase awareness of the problem and treatment options. We would also like to propose increased collaboration between dedicated treatment centres for problem gamblers to ascertain whether similar patterns are being observed to increase learnings. This is in line with Gainsbury et al.’s suggestion that public education is needed to ‘demystify’ the treatment process (Gainsbury et al. 2014). It is important to acknowledge several limitations. This was a small study and was reliant on volunteers, self-report and retrospective assessment of barriers to help-seeking. Only focusing on one NHS outpatient clinic with a specific way of working may not have yielded analogous results to those of other treatment centres. Since no other study of this kind currently exists in the UK it is not possible to ascertain whether findings are typical, therefore it is prone to issues of generalisability. More research is needed in the same area in order to substantiate the current study and enhance reliability. It would be useful to conduct the study on a larger scale, across a range of problem gambling treatment centres in the UK as well as non-specialist settings to determine whether perceptions of barriers to treatment differ according to other elements. This study could also be done on an international scale, taking into account contextual factors for females. This would add to the findings from this small-scale study and inform treatment providers. The absence of a male comparison group precludes forming conclusions on gender differences in the experience of treatment for female problem gamblers. While our intent was to focus on females, to address a gap in the literature, in doing so, we have missed out on additional information which could have been provided by males. Future research on males’ perspectives would be valuable either in conjunction with, in comparison to, or separately from studies investigating female treatment experiences and barriers. Participants who volunteered were in treatment and felt able to speak about their difficulties, and therefore they had recognised and admitted gambling posed a problem for them. Since the method relied on self-report, it is vulnerable to weaknesses, including faulty memory, factual errors and self-presentation biases. Furthermore, those gamblers who had not yet taken these steps or struggled to articulate their difficulties were not represented in the data. Therefore gaps remain in research on problem gambling among those who may be more socially, physically or linguistically isolated. In addition it would be useful to speak with problem gamblers who had dropped out of treatment. Several methodological limitations were also identified. While IPA can provide a detailed picture of a participant’s experience, reflecting the complexity of this experience and its embedded nature in the individual lifeworld, it cannot explain social processes. A grounded theory study may provide a greater understanding of the high attrition rates at the NPGC, explaining some of the processes behind this phenomenon, and it could go further to explain what it is that stops females from coming forward for help, generating theory. Unlike IPA, grounded theory claims to be generalisable based on theoretical saturation. A strength of this study was the richness of the data illicited from participants. Since questions were open ended, responses can provide a vivid picture of respondents’ experiences, rather than forcing choice or categories via quantitative methods such as questionnaires. Open-ended interviews can help identify the particular aspects of barriers which are most troubling to this subgroup of problem gamblers, with the emphasis placed upon particular barriers and how they inhibit help-seeking. Future research could explore barriers to treatment on a deeper level, for example investigating whether obstacles acquire special meaning in certain situations or subgoups of women including age, marital status, employment, religion, class and area. It could also examine specific barriers more rigorously. Future research could also investigate attrition in female problem gamblers on both a national and international scale, however for a detailed exploration of this topic, interviews or questionnaires would need to be conducted with women who had dropped out of treatment or those who had not yet engaged in treatment. Gaining access to this hidden population is likely to be more complicated. The recruitment sample pool and methods would need to be expanded to online forums. Additional research could examine awareness of professional sources of help and help-seeking behaviours among gamblers and problem gamblers in the UK. Finally, future research should also focus on other hard to reach populations which show increasing participation in gambling, including adolescent problem gamblers. The field of problem gambling is a complex area where further research is needed to establish whether there is a more effective way to reach and engage women with problems in this area. Despite the relative variance of treatment episodes, gambling preferences, age and demographics of the sample, there was considerable consensus regarding barriers to treatment. Fundamentally for this cohort of female problem gamblers, overlapping internal and external barriers appeared to have delayed their decision to seek help sooner. These barriers to help-seeking can be addressed with changes to the way help is offered, perceived and delivered. While funding and resources within the NHS must be taken into account, it is argued that the therapeutic encounter itself may be instrumental in breaking down some of the barriers to support and engage women. Attention should be paid to providing individualised, bespoke treatment experiences which provide a ‘secure base’ founded on a strong therapeutic alliance. More research is needed to expand our understanding of which treatment models are most effective. In addition, public education with regard to problem gambling should be stepped up to increase awareness, reduce stigma and encourage help-seeking among those with problems in this area. Bellringer, M., Pulford, J., Abbott, M., DeSouza, R., & Clarke, D. (2008). Problem gambling-barriers to help-seeking behaviours. Auckland. Retrieved from: http://aut.researchgateway.ac.nz/bitstream/handle/10292/2014/Report%20final%2010%20September%202008.pdf?seq. Halliwell, E., Main., L, & Richardson, C. (2007). The fundamental facts, latest facts and figures on mental health. New Delhi: Mental Health Foundation. Retrieved from http://www.mentalhealth.org.uk/content/assets/PDF/publications/fundamental_facts_2007.pdf?view=Standard. The Productivity Commission. (2010). Retrieved from http://www.pc.gov.au/inquiries/completed/gambling-2009/report. Wardle, H., Moody, A., Spence, S., Orford, J., Volberg, R., Jotangia, D., et al. (2011). British gambling prevalence survey. London: National Centre for Social Research. Retrieved from http://www.gamblingcommission.gov.uk/PDF/British%20Gambling%20Prevalence%20Survey%202010.pdf. Wardle, H., & Seabury, C. (2013). ‘Gambling behaviour’ in Craig, R., Mindell, J. (Eds. ), Health survey for England 2012. Leeds: Information Centre for Health and Social Care. Retrieved from http://www.hscic.gov.uk/catalogue/PUB13218/HSE2012-Ch7-Gambling-behaviour.pdf.